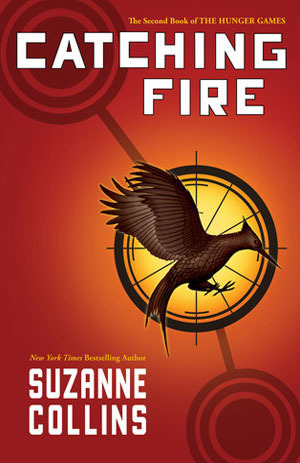 Sign into Goodreads to see if any of your friends have read Catching Fire. “Suddenly I know just what I’m going to do. Something that will blow anything Peeta did right out of the water. I go over to the knot-tying station and get a length of rope. I start to manipulate it, but it’s hard because I’ve never made this actual knot myself. I’ve only watched Finnick’s clever fingers, and they moved so fast. After about ten minutes, I’ve come up with a respectable noose. I drag one of the target dummies out into the middle of the room and, using some chinning bars, hang it so it dangles by the neck. Tying its hands behind its back would be a nice touch, but I think I might be running out of time. I hurry over to the camouflage station, where some of the other tributes, undoubtedly the morphlings, have made a colossal mess. But I find a partial container of bloodred berry juice that will serve my needs. The flesh-colored fabric of the dummy’s skin makes a good, absorbent canvas. I carefully finger paint the words on its body, concealing them from view. Then I step away quickly to watch the reaction on the Gamemakers’ faces as they read the name on the dummy.